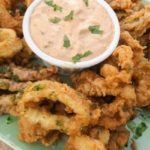 Fried Calamari with Creamy Chipotle Sauce | Mexican Appetizers and More! That was many, many years ago…. I’ve enjoyed calamari n many Italian dishes, Latin dishes, in salads, in tacos, in soups etc…love, love calamari! And I especially love tender fried calamari especially with a great dipping sauce. So here’s one of my favorite ways of many this delectable dish. It’s simple and hyper delicious, especially with this Creamy Chipotle sauce! Here’s something, did you know that fried calamari, is considered one of the classiest of fried foods?! Being so delicious how could it not be! Ok so first, let me start by explaining a few things about this here squid. A squids body is made up of two key parts. The mantle and tentacles. The mantle is the long cone shaped exterior. And even if you have never eaten squid ever before, surely at some point you have seen the very familiar O-shaped rings. These come from the mantle of the squid. And if by chance, you have been at some restaurant and wondered, “What is that person eating? Hmm, it looks like onion rings? Maybe now you will wonder if it is indeed fried calamari. As for myself, I love the tentacles the best! I love them! I find the tentacles to be tastier. If not cooked correctly or over cooked, calamari tends to become tough and rubbery. But no worries, there are some tips and tricks to making sure your calamari comes out tender and hyper delicious. For the best most tender FRIED CALAMARI you must follow some rules….. Calamari must be fried in VERY hot oil….. Whether you use flour or cornstarch, coat your calamari at the very last second, right before you are ready to cook it. If you have the time to follow this step, please do, you will be pleased you did! 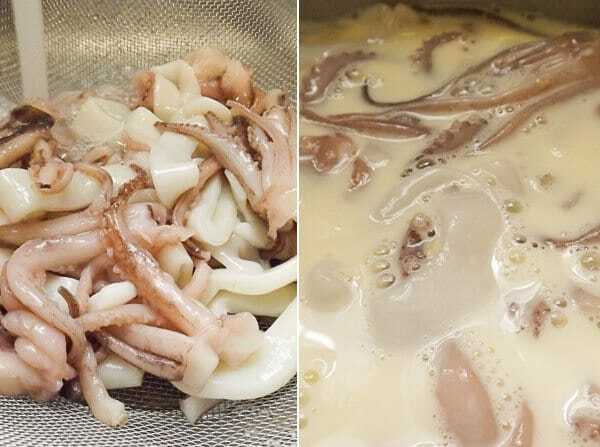 After you have cut up the mantle into rings and tentacles are also ready, rinse and soak in buttermilk/egg mixture for 20 minutes or an hour. Even better yet, soak calamari overnight in a bowl and store in fridge. This step helps in preventing the calamari from becoming tough and rubbery. You cannot have the best fried calamari without a great dipping sauce! But if you don’t want to follow the traditional marinara dipping sauce, I urge you to try this creamy chipotle sauce. 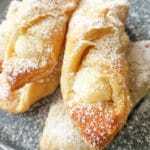 Delicious and also very simple to make. A little bit of mayonnaise, chipotles peppers in adobo sauce, fresh garlic, lemon and salt=DONE and YUMMYNESS!!! I also like to drizzle a cilantro vinaigrette over my fried calamari. A little bit of olive oil and fresh cilantro, simple! Totally optional but surely worth it. 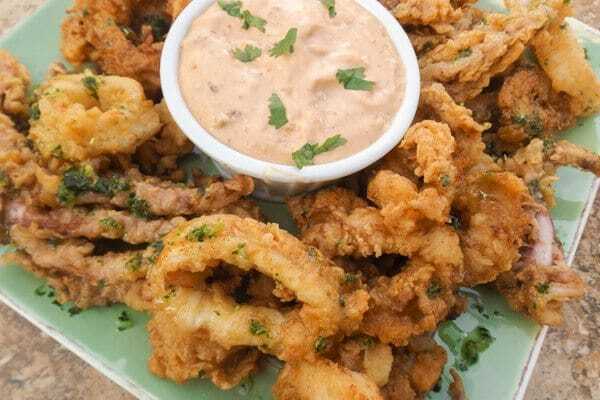 Another delicious sauce to serve fried calamari with is this creamy garlic aioli sauce. Light mayonnaise, fresh garlic, zest of a lemon and fresh parsley. YUM! 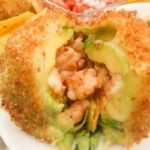 For another delicious dish using calamari, you may also like this Mexican dish. Pozole de Mariscos recipe or Seafood Pozole. 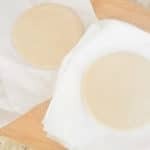 NOTE: If you would like to learn how to clean squid or calamari the right way, take a look at this article by The Spruce. I hope you love this Fried Calamari with Creamy Chipotle Sauce as much as we do! So Yummy! 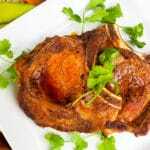 Add the chipotle peppers, mayonnaise, lemon, garlic and pinch of salt to a food chopper and blend unto well combined. Add salt to taste. Set aside. Add the cilantro and olive oil to a blender and blend for a few seconds. Set aside. Mix all the ingredients together and refrigerate until ready to use. Rinse squid under cold running water. Separate the body from the tentacles with a knife. Cut body (mantle) of squid into 1/2 inch rings and cut tentacles into two to three pieces. In a bowl whisk egg and add buttermilk. Add calamari pieces and let soak for 20 minutes. In a fryer or heavy pot, add about two inches of oil and heat to 375 F (190 Celsius). In a bowl mix flour, paprika, salt and pepper. 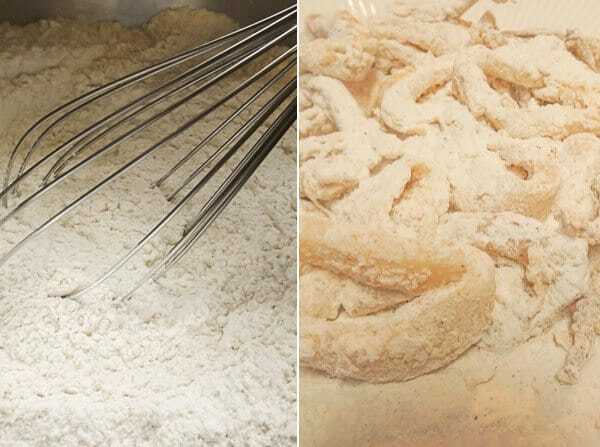 Toss the calamari in with the seasoned flour to cover. Shake off excess flour. Fry until golden brown (90 seconds). No longer than about two minutes or the calamari will become chewy and rubbery. 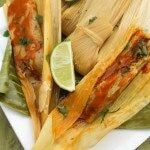 Serve with Creamy Chipotle sauce and serve immediately. Sprinkle Cilantro Vinaigrette over top of calamari. Omg yesss! 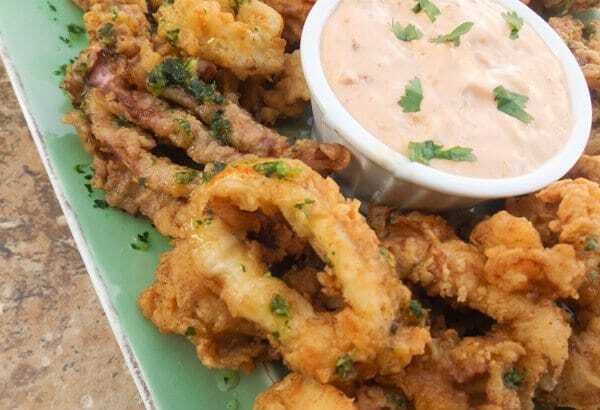 My husband loves calamari and this creamy chipotle sauce is perfect! Thanks for sharing this! 🙂 I hope he does too! Let me know! Thanks Neli! I love calamari too! Yes it makes the calamari perfectly tender! Thanks for commenting Lizzie. Oh wow LOVING the sound of that sauce! This looks and sounds so delicious! Both my boys love calamari and I am always looking for something different to try with it. Definitely trying this ! Thank you!